Extra long cardigans are not new to the game. That being said, back when they first entered my closet, I’ll admit: I was a little thrown off by them. They’re like actual robes that are socially acceptable to wear – how do you make that a look? But when it comes to things that are basically just blankets that are socially acceptable to wear in public, I’m willing to make it work. And now, here I am – with my current go-to being an extra long (also fuzzy) cardigan. I think I ran straight past “making it work” and am happily settled into “living in this look”. 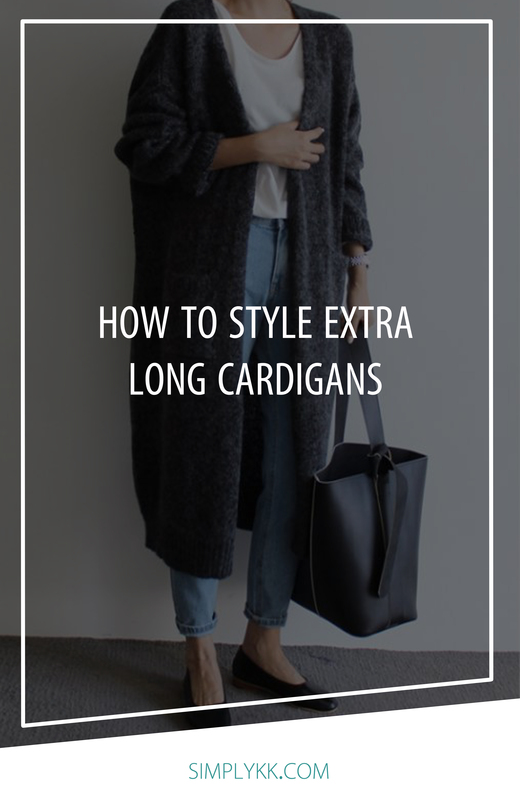 How to style extra long cardigans? Turns out it’s actually pretty simple. Proportions are everything. When you’re styling an extra long sweater, try pairing it with a top that’s tucked (or half-tucked) to balance out the length, or skinny jeans to balance out the oversized element of the cardigan. Balance. will. save. you. Regardless of whether you’re putting together a work look or a weekend look, a jeans look or a dress look, pick out your shoes and run with it. Or walk with it, you know, depending on the shoes. Lately I’ve been loving the combination of an extra long sweater with either heels (for work) or booties (for the every day) because it adds length. On me, it makes it look less like I’m drowning in the sweater and more, you know, stylish. An extra long cardigan with sneakers and denim, though, has that effortlessly cool vibe that I talk about 24/7 and is just as classic of a combination. Texture. Side slits. Draping. Little details make a big difference, especially when it comes to something like oversized cardigans. They can turn the look from blob to something dimensional, something with features. Take into consideration not only the details on the cardigan itself, but how it plays into your look as a whole. I’m currently loving this combination of smooth leather pants and a fuzzy, extra long cardigan. Perfect example. Having A+ shoes like the ones above doesn’t hurt, either. You’ll notice some recurring themes in all of these looks: simplicity. Sure, you can accessorize your look, and yep, you can layer up, too. But bottom line, taking it back to the basics = definite success with styling oversized cardigans. Neutral color palettes (insert me being a broken record on this one), timeless pieces, and a minimal amount of extras make for a classy look – regardless of whether or not you pair it with sneakers or heels.